View of the newly protected property at Vosburgh SwampRobert Rodriguez, Jr. This wooded property adjoins Scenic Hudson's Vosburgh Swamp Natural Area, increasing to more than 270 acres the ecologically important lands we've preserved here. 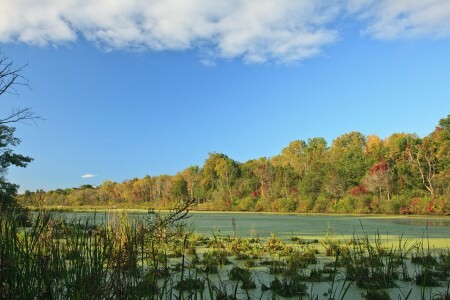 Located within the state-designated Columbia-Greene North Scenic Area of Statewide Significance and Middle Ground Flats Significant Coastal Fish and Wildlife Habitat, its permanent protection was identified as a priority of the New York State Open Space Plan -- a blueprint for the state's land-conservation efforts. Our purchase of the property buffers Vosburgh Swamp from potential development along busy State Route 385 and preserves outstanding views from the Hudson River as well as Scenic Hudson's Harrier Hill Park and the Open Space Institute's Greenport Conservation Area, both located across the river. The possibility exists of creating a trail along an abandoned railroad bed that traverses the land. The purchase is part of Scenic Hudson's collaborative campaign to Save the Land that Matters Most, protecting 65,000 acres of great scenic, ecological and agricultural significance.